As they say, a picture speaks a thousand words. Or does it? 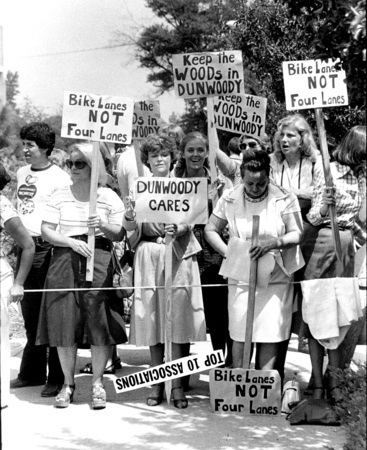 The photo above is from 1979 as Dunwoody residents were protesting plans to widen Ashford Dunwoody Road from two lanes to four. My question is, who are these futuristic, forward-minded progressive people that wanted Bike Lanes in Dunwoody? What happened to their cause during the 1980's and 90's as Dunwoody saw exponential growth? Did they fight tooth & nail with DeKalb County and the developers to have Bike Lanes -- and perhaps even Greenways, Trails or Sidepaths -- incorporated in the development plans? Did they value the ability to have a choice in local transportation, to run an errand, go shopping, checkout a book or do some research at the library (this was before the Internet, after all), or send their kids to school on a bike? What happened with their cause? Where are they today, and where are their signs, Letters to the Editor and Public Comments at City Council Meetings supporting Bike Lanes today?